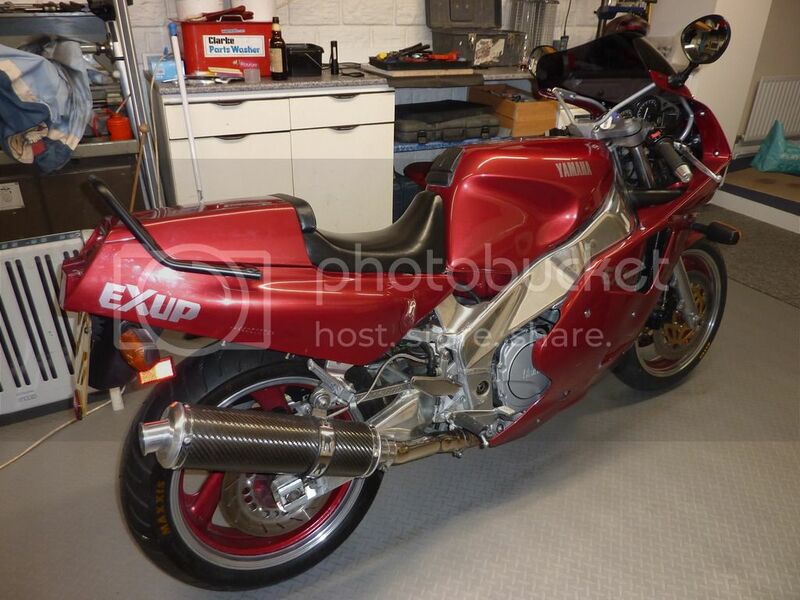 Exup1000.co.uk :: View topic - Bike ready for road but something bent? Posted: Sat Mar 23, 2019 10:07 pm Post subject: Bike ready for road but something bent? Finished the budget cheap bike. New caliper seals, fork seals, new front tyre, all fluids etc. Serviced the Exup valve (but looked fine when I removed it). The axle bolt was bent (managed to get it reasonably straight by placing in the lathe chuck and giving it a tap) looking for a good one if anyone has a spare. The other problem is the distance between the discs and the fork legs, when the axle is tightened up the wheel twists slightly meaning there is about 3mm difference between each disc and leg (I wondered why the old pads were worn tapered when I took them out). I took her for a spin up the road and noticed when in a straight line the top yoke is not straight (although the bike rides fine). The fork tubes are straight (I checked this when replacing the seals by rolling them on the worktop) but only noticed things were not right when everything was bolted up. The rear edge of the front mudguard is closer to the wheel on one side than the other. I thought it had been down the road at some point as the fairing frame is a bit wonky. What does everyone think? Try swapping yokes first? And some others in bits somewhere! My method is slacken bottom clamp bolts. Hold front wheel straight ahead between your knees. Move handlebars side to side a few times using sharp movements. Check all is good and tighten clamp bolts. Of course this won't work if your yokes or headstock are damaged. Just been and had a go (plus point having an attached heated garage and the wife is out with her mates)! looks a little better but won't know for sure until I go for a spin. You need a new axle for starters. I'm guessing a slight misalignment would be magnified as you head north through the brakes to the yokes. It's not an area that you can bodge. I have a spindle from a FZR 750/1000 Genesis which may or not fit also a set of fork clamps (well the whole triple tree) from the same bike. Let us know if you could use them. Frame looks fine, but I do think the yokes are twisted. I'm going to strip it down and have a closer look. Axle is scrap (as you tighten it up the wheel moves from side to side) so maybe interested in the FZR 750/1000 Genesis axle if it will fit? At the end of the day the bike cost me £200 so I don't mind spending a quid or two to put it right. Didn't look too close when I first saw it as I wanted to get it away before he changed his mind. I had this with my first Fazer 1000. Bottom yoke was bent which was easy enough to find once I took it off & placed it on a flat surface. Unfortunately for me a straight one still didn't solve the problem as the head stock was also bent! Broke the bike for spares & bought another. Just found these on eBay. Any good to you? Cheap at the moment because he's just put them on.